CNN Host Grills Jill Stein Over Putin Meeting [VIDEO] - Joe.My.God. 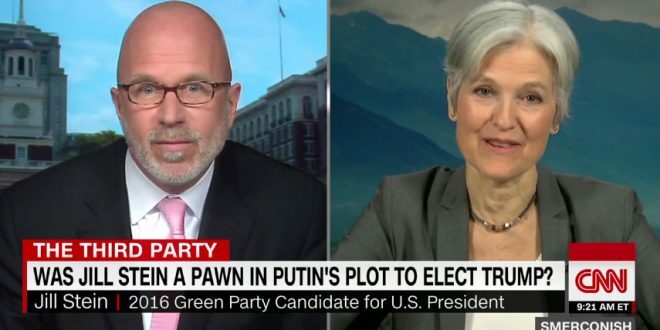 The Green Party’s Jill Stein says a recent spike in interest about a photo of her having dinner with Russian President Vladimir Putin can be traced to Democrats “looking for someone to blame” for their election struggles. The photo, from late 2015, shows Stein seated at a table at a Moscow gala with Putin and Mike Flynn, who would go on to become the national security adviser to President Trump. It has been reported that Flynn was paid $45,000 to speak at the gala. Stein also sought to shut down people who blame her for stealing votes away from Hillary Clinton, resulting in a Trump victory on Election Day. “Hillary Clinton did not earn the votes of Greens,” she said, adding that both Clinton and Trump failed to attract the support of 45 percent of eligible voters who didn’t cast ballots in November.